A few months ago I had a great meeting with my Co-Founder Bradley Clark and we were chatting about the acceleration of the recruitment industry’s transition away from its traditional HR heritage towards adopting the best practices, approaches, and technology found in the Marketing industry (which we’re excited about!). Brad talked about how you could literally read any article about marketing and each time you read the word ‘marketing’ you replace it with the word ‘recruitment’, and each time you read the word ‘customers’ you replace it with the word ‘candidate’ then the article will take on a completely different, yet highly relevant angle; giving us a snapshot into the future of where the recruitment industry is heading. It’s really cool and actually works — go try it and see for yourself! I’ll let that sink in for a moment… Think about it. REALLY think about it, and now believe it. Once you authentically believe that candidates are really consumers, then everything clicks and it will fundamentally change the way you approach Talent Acquisition. Suddenly, you’ll be looking at our industry through a new, clearer, and revealing lens. Candidates are not job searching anymore, they’re job shopping. When you study the steps in a candidate journey and compare it to a typical consumer journey, the similarities are plentiful. Candidate Behaviour IS Consumer Behaviour. Awareness: Before you’ve started looking, you’re already aware of companies like Apple, Samsung, Nokia, Motorola, LG, and Blackberry due to their branding, advertising and promotions. Consideration: You’ll Google search the handset options, read user reviews, compare different products, ask your friends etc. Conversion: You’ve decided that it’s a good option to upgrade your phone. Decision: You’ve visited a number of cell phone stores, talked to sales agents, negotiated price and terms, and chosen the best handset and plan that fits your individual needs. Buy: Transaction completed and cell plan contract signed. Now let’s compare those steps to the job search process. The graphic below shows the typical customer journey through a 5-stage marketing funnel from awareness to purchase as demonstrated above. 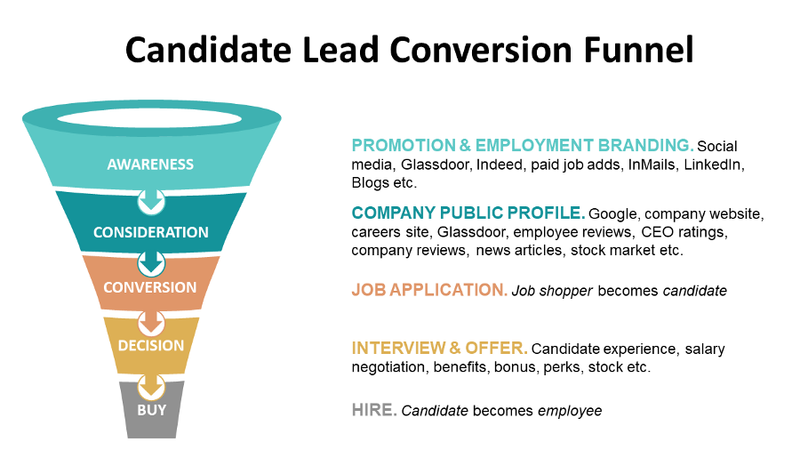 On the right you’ll see the typical journey that a candidate will take through the talent acquisition process. Recruiters need to think and act like marketers to increase and nurture the number of talent ‘leads’ to be converted into candidates. If you do this, you’ll be working with deeper candidate pools which will increase candidate quality and reduce time-to-hire. Unfortunately, the majority of the technology in our industry only focuses on the Job Application and Interview stages. Recently, Recruitment Marketing CRMs have started to address the top-of-the-funnel sections, but the software available is expensive and out of reach for most recruiters. The good news is that at myRecdex we’re building a personal Recruitment Marketing CRM to enable all recruiters to have access to AI-driven Recruitment Marketing technology — not just the teams that have large budgets — so that we can all play a part in elevating our industry by thinking and acting like marketers.